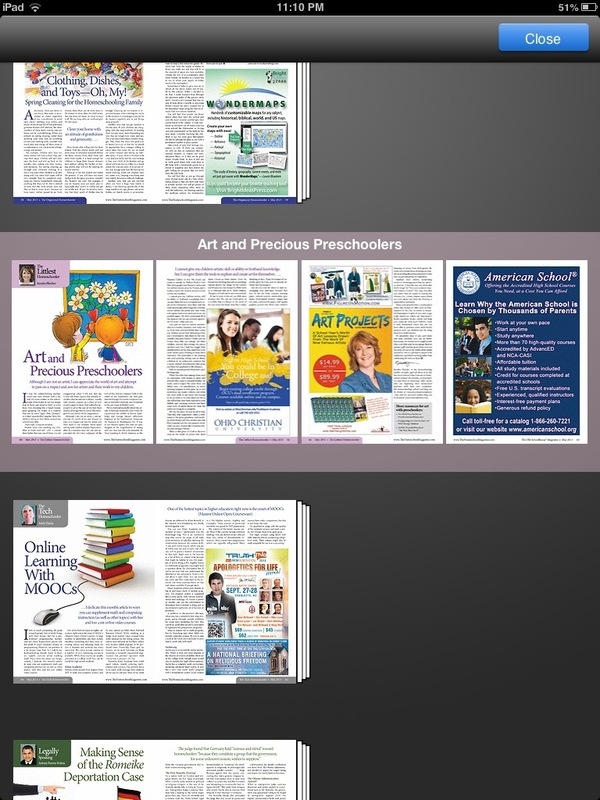 Did you know that the Old Schoolhouse Magazine is now digital and it is free? Occasionally we have had subscriptions in the past to the Old Schoolhouse magazine. I am also signed up for the email newsletter but somehow I missed the transition to digital. Since the magazine is no longer in print (except as a yearly volume) The Old Schoolhouse stared a special online education portal. It is called SchoolhouseTeachers. 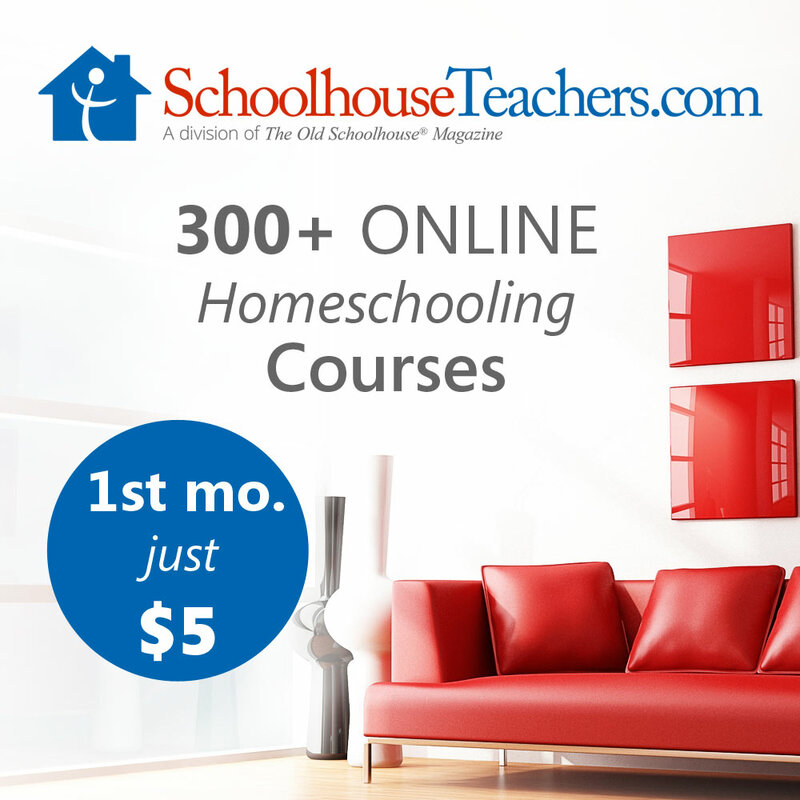 Not only is the Old schoolhouse digital magazine free but you can try out Schoolhouse Teachers for a year free if you are a homeschool legal defense member! The digital version of the Old Schoolhouse magazine is like typical magazine. You can scroll through different volumes. It looks like the archives go back quite a ways but I quit looking at 2010 issues. Navigation in the magazine app is not the most fluid experience but it works OK. There is also a search function that could help find a specific topic. by our two year old. I am surprised it did not happen sooner. I have let the kids use the iPad for the last two years so I guess I was getting complacent. My older son was trying to get my five year old to come for dinner. He was trying to get my son to stop playing on the iPad. 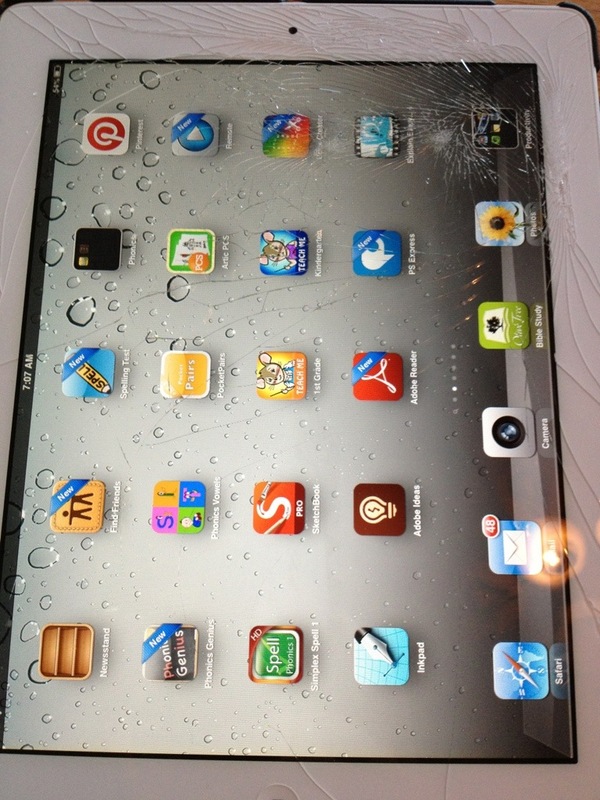 Somehow the iPad dropped on a paint can! That’s right a paint can that just happened to be in the living room. Even though I don’t have any “games” installed on the iPad my five year old would play on the iPad every hour if he could. since the screen got cracked I decided to I put a password lock on the home screen so he can’t play on it without our permission. 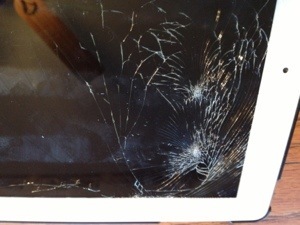 I was surprised the iPad still worked with the broken digitizer. It looks like just the glass was broken but unfortunately you have to replace the whole iPad digitizer assembly which is very difficult. 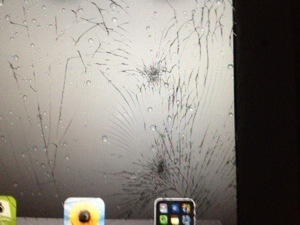 Thankfully I paid extra to add the accidental insurance from Best Buy. I just dropped it off today to be repaired. that has been damaged by little children. Now I am a firm believer in mobile device insurance. What do you think about kids and mobile devices? How do you protect your tablet? I just came across this video that made me think twice about why and how I homeschool. It is similar to a lot of the talks Sir Ken Robinson has over at Ted talks. This talk is called “Stop Stealing Dreams” by Seth Godin. You can download Seth’s book for free at this link. What do you think? I don’t totally agree with everything Seth says, but I think has does have some good points. So for now I will keep using google but I will also keep making my kids learn spelling words. Technology is great. It can make our lives easier. Technology will magically teach your children right? Wrong! When the iPad first came out I thought it would be the best thing for homeschooling. While the iPad is great for homeschooling it doesn’t magically reduce the work required for homeschooling. Sometimes it would be nice to sit my kids down with the iPad and learn all they need to know. It just doesn’t happen that way! Your kids actually need to interact with you the parent and teacher. Oh yeah – the other reason you cant rely on technology – Technology can’t survive being thrown into an oven. Case in point my wife’s new iPhone pictured above. 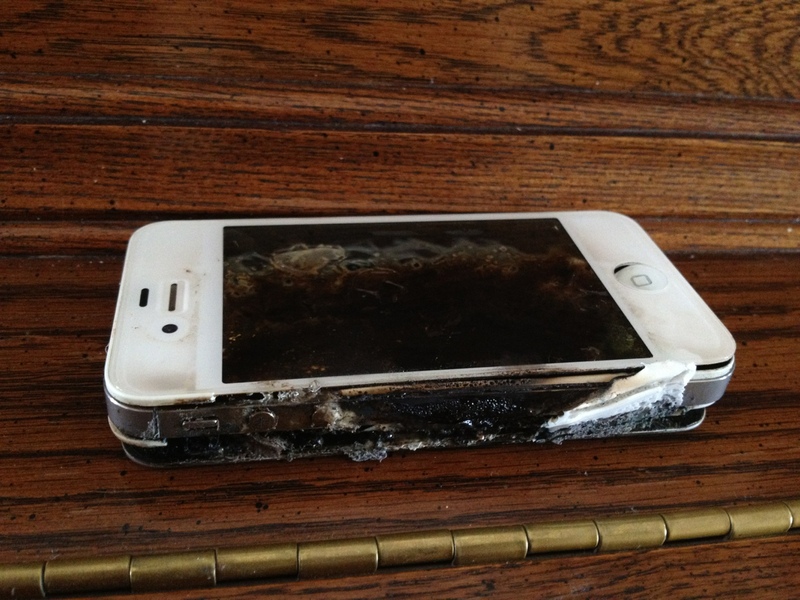 For some reason my two year old put the iPhone in the oven. Usually when he puts things in the oven, we find them before the oven gets turned on! For some reason, on this particular day, the iPhone got toasted by my two year old. Not only can technology go up in smoke it is also expensive to replace. So the moral of the story…don’t let your two year play with your iPhone! Don’t rely on technology to always be the best available tool. Sometimes the old fashion pencil and paper is all you really need. What do you think? Has technology helped with your home school? Are your kids smarter? 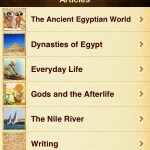 There are several similar apps from Britannica that focus on history. 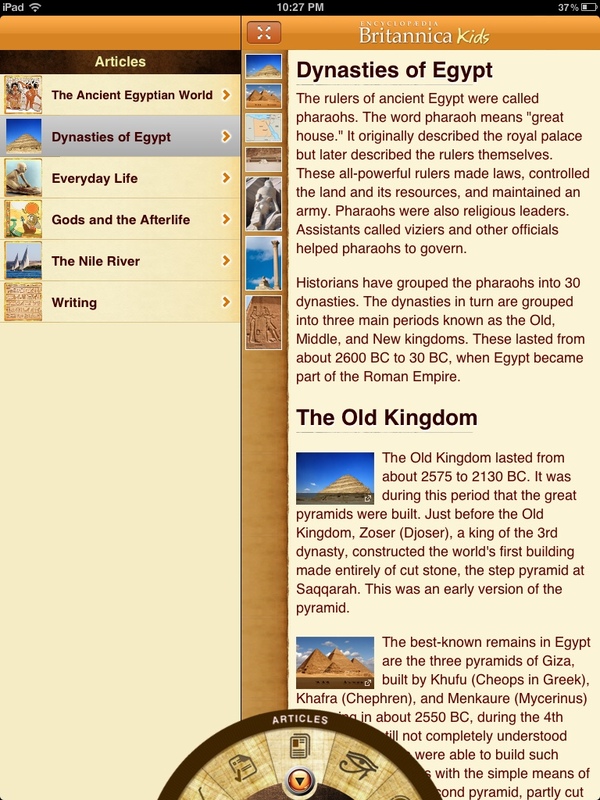 I was able to buy the Egypt app and the Aztec App when it was on sale for $0.99. 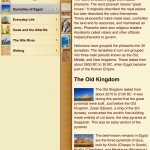 Here is my review of the Britannica Kids apps. The App has a navigation wheel at the bottom. You touch the arrow and the wheel pops up so you can select the different parts of the app. There are several games based on pictures. 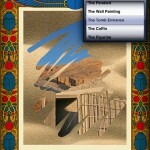 There is a puzzle and there is a picture covered with sand that you can dust off to view the picture. You are supposed to guess the picture but I doubt my kids will do that. There is also a memory game and a magic square puzzle. There are many pictures but I was a little disappointed that there were only two videos. 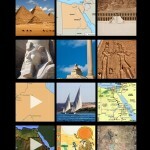 I have used the pictures several time when we were studying Egypt. There are actual pictures of the modern landmarks and historical sites that you can see today. There are also several ancient pictures of art from that time period. There are different articles that describe different aspects of life in the Egypt or Aztec culture. There is a list of the gods. 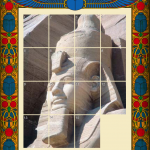 You can click on a god and a description tells you more about that Egyptian or Aztec god. There is a map that shows the location of some of the landmarks along with pictures. When you click on the location the picture is displayed. The Britannica apps are nice and informative but I’m afraid in the highly interactive day we live in the app may not interest very many children. When my children are given the iPad I seldom see them pull up the Britannica apps. There are just too many other interesting educational apps that they want to “play”. Normally the app is $4.99 but if it goes on sale it would be a good reference tool for when you are teaching about the different subjects. Apparently I was wrong about my kids using the Britannica app on their own. 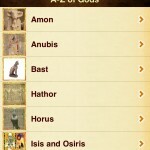 I just downloaded the Britannica Ancient Rome app and my ten year old son picked it up on his own. Maybe it’s the Roman soldier but my son really likes the Britannica Ancient Rome app. Click on the pictures below for app screen shots.